My dad made a rolled pork dinner last summer when I visited them in NC and I've been wanting to try it since. I was reminded when I saw Laura's beautiful pork loin in April and thought "I can do that!" even though cooking pork scares me. Johnny's dad co-owns a meat packing company here in Illinois where he butchers pork. A few weeks ago on a Sunday visit we snagged a fresh 19 inch long loin. I used about 6 or 7 inches of it for pulled pork in the slow cooker, made four 1" pork chops that I pan-fried, and still had an 8 or 9 inch loin! Before I froze the last loin, I butterflied it, just as Laura had instructed. Today I just unrolled it and decided on stuffing choices. Preheat the oven to 350° and cover your work area with wax paper. First I seasoned the pork with salt and pepper. Then I spread the goat cheese on using a rubber spatula until it was evenly covered. Next I sprinkled the minced garlic and celery evenly over the goat cheese. 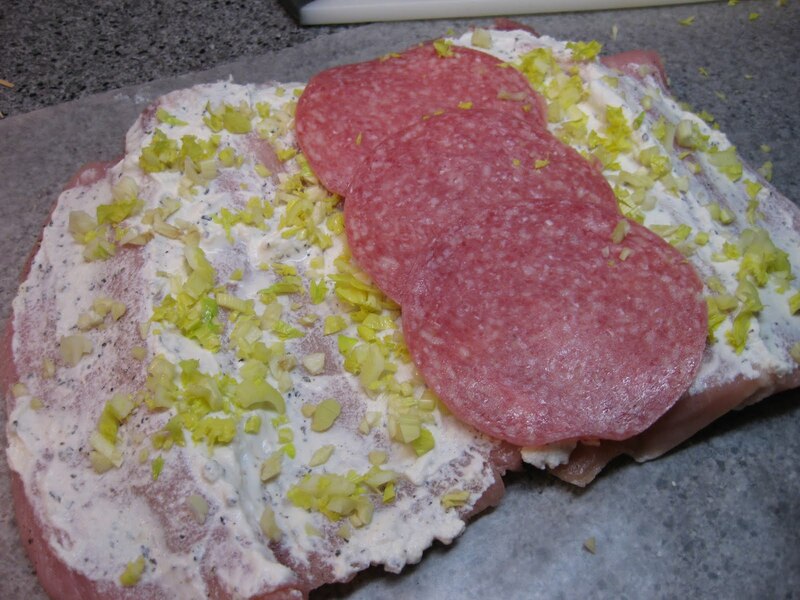 I layed the three pieces of salami so they went across the entire loin. Beginning at the end closest to the salami, I started rolling tightly pushing the ingredients in as needed, until I reached the other end. Pour a small amount of olive oil in the bottom of the baking dish. Place the rolled pork in and turn to coat in the oil. Sprinkle the top with more salt and pepper. Bake, uncovered, for about 1 1/2 hours. Remove the pork when a meat thermometer reads 160-170°. Tent and let rest for about 10 minutes. Slice using a sharp knife and serve displaying the beautiful rolls. I served with some couscous and fresh corn on the cob! It was really juicy and flavorful. The goat cheese stayed really creamy, which gave the bites containing it a nice texture. ohhh love the Chavrie in there!! Thanks for trying the rolled pork loin, aren't they good? Christina, this looks spectacular! I love the celery leave in there ... because they're one of my favorite things. And that pork loin looks truly superior all on its own. I think I'm a little jealous that you have such access to quality fresh meat! I never would have thought to put goat cheese in the middle, but that sounds awesome! Thanks guys! :) It was a lot easier than I feared, Laura! Thanks for showing that it can be easy! OMG! That looks amazing. GOat cheese?! Salami?! Wrapped in pork!! Holy cow! You had me at goat cheese!! That turned out so good - I've never tried a pork recipe like that! oh man that looks SO good!!!! hey you are hitting up the east coast?!?! when where???? tell me tell me!!!! This looks SO good! I love pork loin and have only cooked it with a rub or a sauce...I've never thought to stuff it! Definitely going to have to try this!